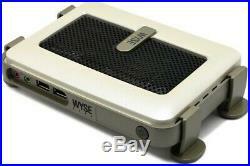 Wyse SX0 S30 902113-38L Thin Client AMD Geode GX 366MHz 128MB 64MB Flash. These items have been refurbished and are confirmed to be fully functional. These items may have minor scuffs or scratches on the housing. If it is not in the photo or stated in the included section, it will not be in the package. An extra charge will be applied to HI, AK, or PR purchasers. Orders will be combined if necessary. Please be sure all items are packed for safe travel. Use a rigid box with flaps intact. Wrap all items separately using at least 2 inches of cushioned packing material. Pack items and all included pieces and documentation in a box, ensuring that the items are not touching the walls of the box. Your product does not match the listing description. You receive the wrong product. Your product matches the listing description. Headquartered in Jacksonville, FL, USA, our parent company strives to give new life to technology through the refurbishing, reselling and recycling of computers, telephone systems, computer monitors, and network equipment. The item "Wyse SX0 S30 902113-38L Thin Client AMD Geode GX 366MHz 128MB 64MB Flash" is in sale since Friday, April 12, 2019. This item is in the category "Computers/Tablets & Networking\Enterprise Networking, Servers\Servers, Clients & Terminals\Thin Clients". The seller is "refurb-net" and is located in Jacksonville, Florida. This item can be shipped to United States, Canada, United Kingdom, Denmark, Romania, Slovakia, Bulgaria, Czech republic, Finland, Hungary, Latvia, Lithuania, Malta, Estonia, Australia, Greece, Portugal, Cyprus, Slovenia, Japan, China, Sweden, South Korea, Indonesia, Taiwan, Belgium, France, Hong Kong, Ireland, Netherlands, Poland, Spain, Italy, Germany, Austria, Bahamas, Israel, New Zealand, Philippines, Singapore, Switzerland, Norway, Saudi arabia, Ukraine, United arab emirates, Qatar, Kuwait, Bahrain, Croatia, Malaysia, Belize, Saint kitts and nevis, Saint lucia, Bermuda, Brunei darussalam, Bolivia, Egypt, Guadeloupe, Cambodia, Sri lanka, Macao, Maldives, Nicaragua, Oman, Pakistan, Paraguay, Uruguay.